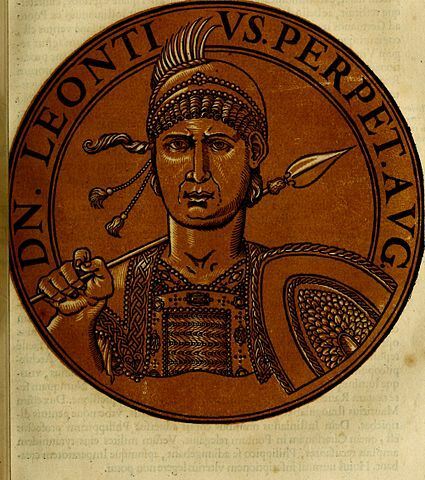 Leontios was Byzantine emperor from 695 to 698. Little is known of his early life, other than that he was born in Isauria. He was given the title of patrikios, and made Strategos of the Anatolic Theme under Emperor Justinian II. He led forces against the Umayyads during the early years of Justinian's reign, securing victory and forcing the Umayyad caliph to sue for peace. In 692, he was imprisoned by Justinian II for losing a battle against the Arabs. After being released in 695, he led a rebellion against Justinian, and seized power, becoming emperor in the same year. He ruled until 697, when he was overthrown by the general Apsimar, who took the royal name Tiberios III.